Welcome to Part Two of our Nineteenth Century Knit-Along! I hope you’ve had fun with the Beginning Edging. If you’re just tuning it, you’ll find it here. Your work in that section will have prepared you very well for our next stage: the center. The center section contains by far the most knitting, so we’re allotting two full weeks to it. Before you charge forward, I’d like to offer some tips for success. The number of stitches is the same in all rows. Get into the good habit of stopping every so often to count how many you have. It isn’t difficult to think you’re moving along perfectly, only to find that you’ve accidentally eliminated or added a stitch or two. Usually, the culprit is a missed decrease or a missed yarn over. If you count, say, every ten rows or–better still–every five rows, you can catch the error in time to save yourself a great deal of ripping out. It’s seldom advisable, when ripping out lace is necessary, to simply pull out the needle and rip. Especially in work like this, with yarn overs on every row, the fabric will collapse like a house of cards. Stop regularly, every ten rows or so, and put in a lifeline. First, cut yourself a nice length (about 20 inches will do) of a smooth yarn that looks nothing like your Infinito colorway. 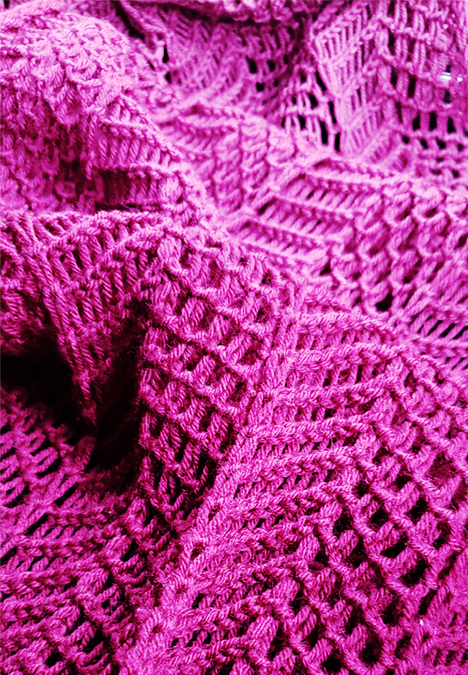 As to weight, I prefer something pretty hefty–worsted or DK would be lovely. Fiber content doesn’t matter much, so long as the yarn isn’t sticky–so stay away from mohair, angora, and the like.Thread this scrap yarn onto a tapestry needle. Once you have counted your stitches and made sure the row of live stitches currently on the needle is complete and correct, run the scrap yarn through every one of those live stitches (EVERY one) including yarn overs. Make sure, once you’ve done that, that you have a nice amount of scrap yarn tail hanging on either side of the work, so the natural movement of the knitting won’t cause your lifeline to slip out. Some knitters like to tie the ends of their lifelines in a simple knot to secure them. I don’t. It’s up to you. What’s the lifeline for? Well, if you have to rip out a section, you can remove the needle and rip back to the lifeline row. It may save time, as opposed to un-knitting stitch by stitch. If (and when) you do need to un-knit, keep in mind how a decrease was made when you set about undoing it. You need to reverse that process. Purl the first stitch, move the yarn to the back of the work, and return (slipping as if to purl) the stitch to the left needle; pass the next stitch over the purled stitch, and return the stitch to right needle. Move yarn to the back of the work; pass the decrease stitch to the left needle; pick up the passed-over stitch with the right needle tip and carry it right to left it over the purl stitch. Return the the purled stitch to the right needle, move the yarn to the front of the work, and un-purl the stitch. I’ve prepared a video of this, for those who would like to see the process in action. Don’t be afraid of it, embrace it. You’ll need it at some point in this adventure. It takes a bit of thought and practice. You can do it. Keep calm. And now, part two of the pattern: The Center. Since there is so much ground to cover with this portion, the final installment will be posted two weeks from today.